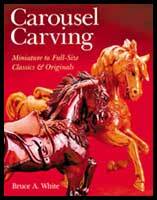 Carousel Carving should appeal to anyone interested in carousels or carving or both. The first half of the book is devoted to the story of carousels, their history, creators and locations. It is beautifully illustrated with some 200 full color photos printed on high quality paper that brings out their brilliance. Dozens of sidebars relate interesting bits of information on carousels and those who carved them. The author discusses the three basic styles of horses. They are the Philadelphia or "Dentzel", distinguished by realistic-looking horses in natural poses; the Coney Island style distinguished by wildly exuberant animals with extravagant embellishments; and the County Fair style, strong, simply carved animals designed to hold up under the stress of being moved every few days in traveling carnivals and portable carousels. Anyone at all interested in carousels should not be disappointed with this full treatment. The book, however, is not only a colorful and well-done reference to early and present day carousels, it is also a "how-to" manual for the would be carver. All the carving and finishing steps are fully covered and profusely illustrated. All that needs to be added is the desire to carve a horse or some other animal in full or in miniature. To the inexperienced carver the author says, "Some carving experience is helpful, but not essential." He talks about the tools, techniques and time involved in going from glued up 2 x 4's to the fully finished animal. The reader will be happily enriched by the knowledge presented and perhaps inspired to pick up the tools to create.